Finland’s schools weren’t always so successful. In the 1960s, they were middling at best. In 1971, a government commission concluded that, poor as the nation was in natural resources, it had to modernize its economy and could only do so by first improving its schools. To that end, the government agreed to reduce class size, boost teacher pay, and require that, by 1979, all teachers complete a rigorous master’s program. The Finnish approach to pedagogy is also distinct. In grades seven through nine, for instance, classes in science—the subject in which Finnish students have done especially well on PISA—are capped at 16 so students may do labs each lesson. And students in grades one through nine spend from four to eleven periods each week taking classes in art, music, cooking, carpentry, metalwork, and textiles. These classes provide natural venues for learning math and science, nurture critical cooperative skills, and implicitly cultivate respect for people who make their living working with their hands. But perhaps most striking on the list of what makes Finland’s school system unique is that the country has deliberately rejected the prevailing standardization movement. While nations around the world introduced heavy standardized testing regimes in the 1990s, the Finnish National Board of Education concluded that such tests would consume too much instructional time, cost too much to construct, proctor, and grade, and generate undue stress. 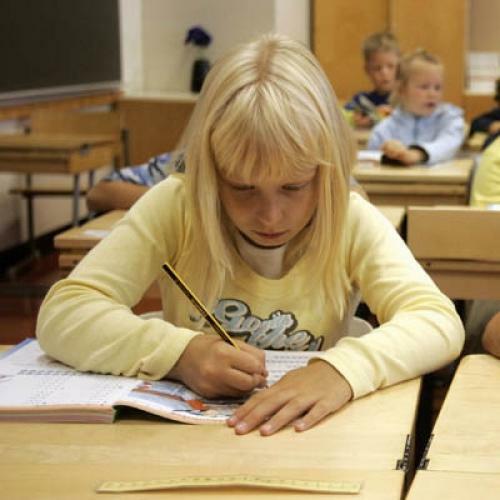 The Finnish answer to standardized tests has been to give exams to small but statistically significant samples of students and to trust teachers—so much so that the National Board of Education closed its inspectorate in 1991. Teachers in Finland design their own courses, using a national curriculum as a guide, not a blueprint, and spend about 80 percent as much time leading classes as their U.S. counterparts do, so that they have sufficient opportunity to plan lessons and collaborate with colleagues. The only point at which all Finnish students take standardized exams is as high school seniors if they wish to go to university. The Finnish business community and conservative members of the country’s parliament criticized the end of tracking as a recipe for mass mediocrity—but they went silent following the publication of the 2000 PISA results. “PISA was a lucky gift for Finnish educators,” said Kari Louhivuori, the principal of the Kirkkojärvi Comprehensive School in Espoo, who began his career as a teacher in 1974. “We were under attack from traditional forces and needed outside validation of our new way.” (Some testing is thus ultimately necessary, Louhivuori conceded, if only to prove that regular testing is not.) What’s more, there is now strong proof of the economic benefits of the Finnish educational reformation, particularly in the country’s high-tech sector, which is distinguished by Nokia in telecommunications, Orion in medical diagnostics and pharmaceuticals, Polar in heart-rate monitors, Vaisala in meteorological measurement, and VTI in accelerometers. Flanking highways out of Helsinki are research centers for these companies, as well as ones for Ericsson, IBM, and SAP. The reflexive critique of comparing the Finnish and U.S. educational systems is to say that Finland’s PISA results are consequences of the country being a much smaller, more homogeneous nation (5.3 million people, only 4 percent of whom are foreign-born). How could it possibly offer lessons to a country the size of the United States? The answer is next door. Norway is also small (4.8 million people) and nearly as homogeneous (10 percent foreign-born), but it is more akin to the United States than to Finland in its approach to education: Teachers don’t need master’s degrees; high school teachers with 15 years of experience earn only 70 percent of what fellow university graduates make; and in 2004,* authorities implemented a national system of standardized testing. The need for talent in the classroom is now so great that the Norwegian government is spending $3.3 million on an ad campaign to attract people to teaching and, last year, launched its own version of Teach for America in collaboration with Statoil—called Teach First Norway—to recruit teachers of math and science.